Our enterprise NAS reviews have focused on Atom-based desktop form factor systems till now. These units have enough performance for a moderately sized workgroup and lack some of the essential features in the enterprise space such as acceptable performance with encrypted volumes. A number of readers have mailed in asking for more coverage of the NAS market straddling the high-end NAS and the NAS - SAN (storage area network) hybrid space. Models catering to this space come in the rackmount form factor and are based on more powerful processors such as the Intel Core series or the Xeon series. Synology's flagship in this space over the last 12 months or so has been the RS10613xs+. Based on the Intel Xeon E3-1230 processor, this 2U rackmount system comes with twelve hot-swappable bays (two of which are dedicated for caching purposes) and 8GB of ECC RAM (expandable to 32 GB). Both SATA and SAS disks in 3.5" as well as 2.5" form factor are supported. In addition to the 10-bays, the unit has also got space for 2x 2.5" drives behind the display module. SSDs can be used in these bays to serve as a cache. 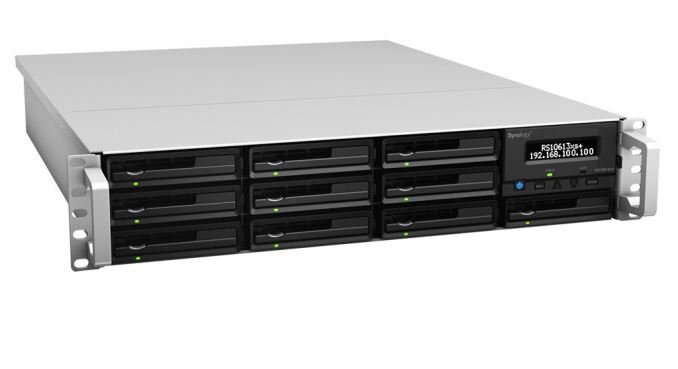 Synology is well regarded in the SMB space for the stability as well as wealth of features offered on their units. The OS (DiskStation Manager - DSM) is very user-friendly. We have been following the evolution of DSM over the last couple of years. The RS10613xs+ is the first unit that we are reviewing with DSM 4.x, and we can say with conviction that DSM only keeps getting better. Our only real complaint about DSM has been the lack of seamless storage pools with the capability to use a single disk across multiple RAID volumes (the type that Windows Storage Spaces provides). This is useful in scenarios with, say, four bay units, where the end user wants some data protected against a single disk failure and some other data protected against failure of two disks. This issue is not a problem with the RS10613xs+, since it has plenty of bays to create two separate volumes in this scenario. In any case, this is a situation more common in the home consumer segment rather than the enterprise segment towards which the RS10613xs+ is targeted. The front panel has ten 3.5" drive bays arranged in three rows of four bays each. The rightmost column has a two-row / one-column wide LCM display panel with buttons to take care of administrative tasks. This panel can be pulled out to reveal the two caching SSD bays. On the rear side, we have redundant power supplies (integrated 1U PSUs of 400W each), a console and VGA port (not suggested for use by the end consumer), 4x USB 2.0 ports, 4x 1Gb Ethernet ports (all natively on the unit's motherboard) and two SAS-out expansion ports to connect up to 8 RX1213sas expansion units. There is also space for a half-height PCIe card, and it was outfitted with a dual 10 GbE SFP+ card in our review unit. On the software side, not much has changed with respect to the UI in DSM 4.x compared to the older versions. There is definitely a more polished look and feel. For example, we have drag and drop support while configuring disks in different volumes. These types of minor improvements tend to contribute to a better user experience all around. The setup process is a breeze, with the unit's configuration page available on the network even in diskless mode. As the gallery below shows, the unit comes with a built-in OS which can be installed in case the unit / setup computer is not connected to the Internet / Synology's servers. A Quick Start Wizard prompts the user to create a volume to start using the unit. An interesting aspect of the Storage Manager is the SSD Cache for boosting read performance. Automatic generation of file access statistics on a given volume helps in deciding the right amount of cache that might be beneficial to the system. Volumes are part of RAID groups. All volumes in a given RAID group are at the same RAID level. In addition, the storage manager also provides for configuration of iSCSU LUNs / targets and management of the disk drives (S.M.A.R.T and other similar disk-specific aspects). RAID expansions / migrations as well as rebuilds are handled in the storage manager too. The other interesting aspect is the Network section. In the gallery above, one can see that it is possible to bond all the 6 network ports together in 802.3ad dynamic link aggregation mode. SSH access is available (as in older DSM versions). A CLI guide to work on the RAID groups / volumes in a SSH session would be a welcome complementary feature to the excellent web UI. In the rest of this review, we will talk about our testbed setup, present results from our evaluation of single client performance with CIFS and NFS shares as well as iSCSI LUNs. Encryption support is also evaluated for CIFS shares. 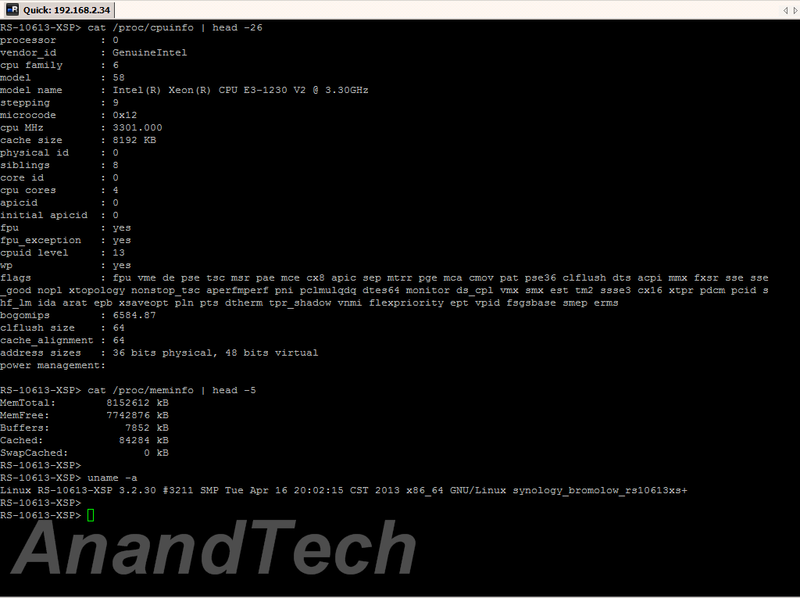 A section on performance with Linux clients will also be presented. Multi-client performance is evaluated using IOMeter on CIFS shares. In the final section we talk about power consumption, RAID rebuild durations and other miscellaneous aspects. Who uses RAID 5 now a days? All the research I have done points to OBR10. Can we see some OBR10 numbers? Here are some articles that explain why RAID 5 needs to die.